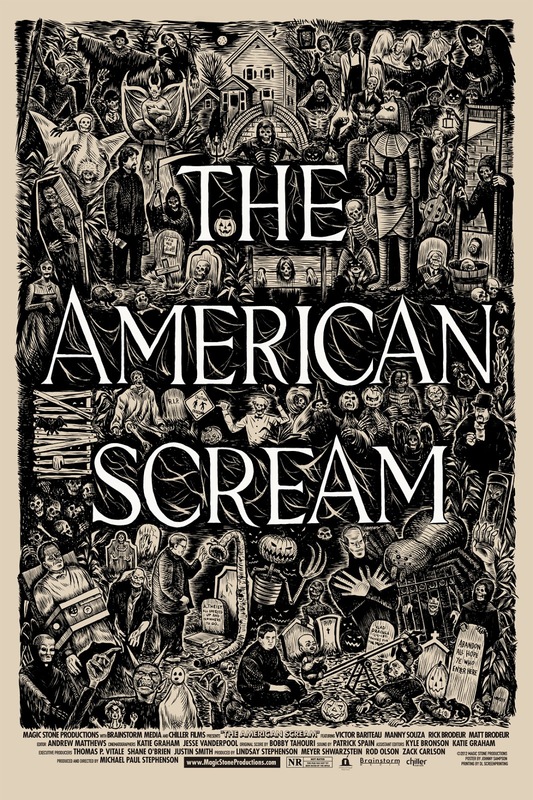 Tonight I finally got around to watching "The American Scream" - the documentary about 3 home haunters (and their long suffering and helping families) in Fairhaven, Massachusetts. For anyone who cares about Halloween, and the work so many of us put into it, this is a tremendously charming, quirky and insightful documentary. And for anyone who may not know, a "home haunter" is a person who creates an (often largely homemade) Halloween experience each October, which transcends mere decorating. Hopefully now that Netlifx has made the film available on their instant streaming service, more people will see this. The three haunters depicted here are of varied strengths, dedications and experiences, but all live for their Halloween haunt. Victor Bariteau is perhaps the most intense and productive of the trio. Along with his wife and two young daughters (the older who truly does share his passion for All Hallow's Eve), friends and volunteers, Victor puts on quite the impressive, artistic and effective home haunt. The family dynamics, philosophies and stories behind Victor and the other two haunters are so very relatable, and it's a much welcomed thing that we have such a depiction and documentation of what has become the subculture that is the American home haunter. 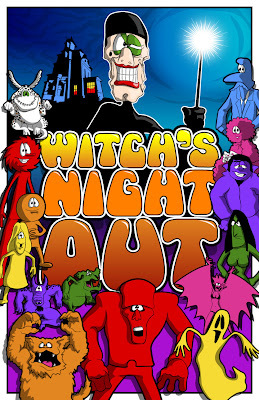 Yes, I highly recommend this little documentary for anyone who cares-- in the least-- about Halloween. You don't have to be a home haunter on the verge of going professional to relate to the absolute joy these men get from working so hard, for so long, to scare their neighborhoods and communities for one night out of the year. Trailer below. As of this writing tonight, all of the Halloween decorations from the front yard are down, and in the house. Most of them are packed away in their boxes. I'm attempting more organization of my Halloween things than I have ever done-- going so far as to take photos of everything I have, and in a neat computer file, organize the photos according to which numbered box they are in. This, as you may expect, with so many things, is a lenghty work in progress. 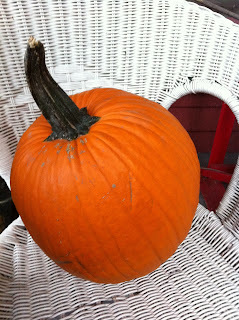 A quick story about this process; of Halloween completely, finally, going away. Two weeks ago, on a crisp, cool November morning-- a Saturday-- I thought I heard someone on the porch. I pulled a curtain aside, and on my porch were three Jehovah's Witnesses, who had not yet rung the doorbell (who I had seen before.) They had not yet rung the bell, because they were too busy looking at the few decorataions-- a cloth-faced scarecrow, cornstalks, plastic jack o'lanterns and a seated skeleton. As I watched and expected them to begin to knock-- one of them took out a cell phone, while the other posed with my scarecrow and a group of pumpkins. I know a great little about the religion, and the nuances of faith and human experience that Jehovah's Witnesses have toward Halloween-- but I do know it is not celebrated. And there was something about seeing them get enough out of what I had left from All Hallow's Eve to want to snap a cellphone picture-- that made my jack o'lantern heart smile. 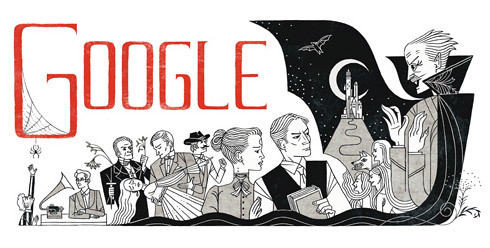 Today, November 8, 2012 is author Bram Stoker's 165th birthday. A day which has brought us a quite thoughtful Google doodle, and-- to my welcomed surprise-- a popular interest in Stoker's life and work online and in social media. In looking through clips and passages and images to mark this post for Stoker's birthday, one comes up with a lot. Few other novels have been capable of creating a character which becomes larger than the book itself-- larger than the other books written because of it, than the movies made based on it, and so on. Although the legend and mythology of the vampire predated Stoker's work, Count Dracula has become synonomous with vampires, and certainly stands as the father of all modern appearances of vampires in popular culture-- as well as the father, in many regards, of modern horror in general. Devices that appear revolutionary in modern horror such as the pseudo-documentary that claims to be real evidence (for instance, the film "The Blair Witch Project") was done years ago with "Dracula" a novel written as all first hand accounts and diary/journal entires. 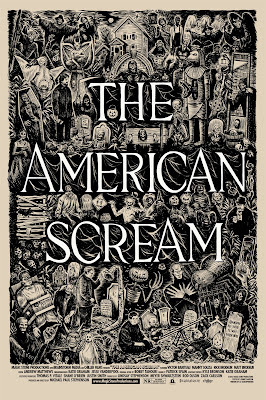 At once, Stoker's novel is atmospheric, truly perfect Gothic horror tale; and, a very worthy piece of serious literature. I've written a bit about readings of "Dracula"-- there is so much in the novel; social commentary on what it means to fear the other (nationally, ethinically, sexually, religiously) abounds, but never hinders the effect the novel has at being such a successful horror story. 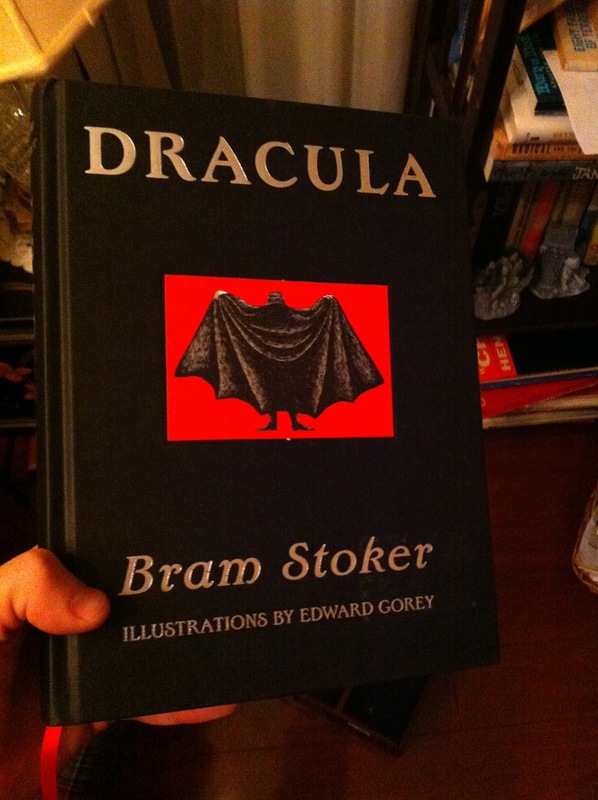 I have many copies of "Dracula," and often can't resist buying new ones I see because I like a cover or a design. Perhaps my favorite copy (other than the worn paperback I devoured in grammar school when I first read it) is this hardback copy featuring the Edward Gorey illustrations. For all the wonderful movies spawned from "Dracula," all the pop-culture art and so on, there is nothing that has ever come up to the experience of reading the book. "3 May. Bistritz. - Left Munich at 8.35..."
My first morning in the Sleepy Hollow area began by searching for somewhere to go for a run. Staying across the Hudson, just on the other side of the Tappan Zee Bridge, I found myself at a hotel in a section of Nyack, New York, that was conveniently located exactly at a thruway exit, but in an area void of any proper sidewalks. I ran up one street, and the sidewalk ended. I ran along another, and in passing wished there were a cemetery somewhere nearby where I could run, as I do in Forest Lawn when I am at home. I ran not twenty seconds down another block, turned a bend-- and an enormous cemetery, set on a large hill, appeared before me. The gates were open, and I would find that the sprawling graveyard spanning the hill was more than large enough to run in, and had graves going back to the very early 1880's, at least. 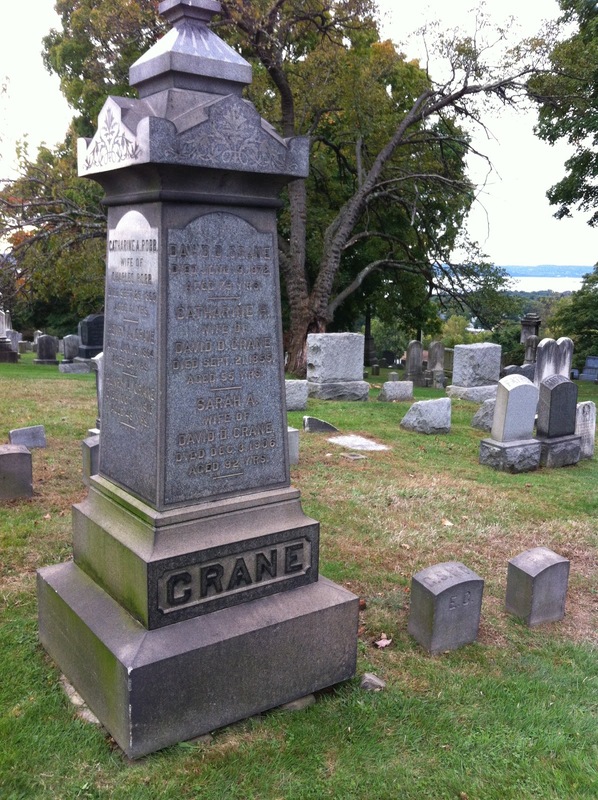 There was even an old plot for a family by the name of "Crane." At the very top of the cemetery, having ran up the hill, you can see over the Hudson River, to Tarrytown and Sleepy Hollow. I was excited to head back over the bridge, pass through Tarrytown, and be in Sleepy Hollow, again. The plan was to wander around the village, see any sights there may be to see, and head to the cemetery. The night before, from what I could see of the cemetery from the Old Dutch Church, I thought I knew how big-- or, rather, small-- it actually was. 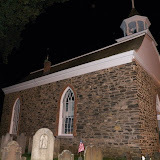 The lantern tour was not until seven in the evening; I thought that after looking around the village, I could see what the full cemetery was like, and take it all in prior to the tour. My first thoughts seeing the Hollow in daylight were, still, that the Horseman was everywhere. From the street signs, to the village hall-- to restaurants, the post office and fire department-- either he was there on horseback, or he was chasing poor, terrified Ichabod. It was also quietly amazing, pleasantly surprising how much the village, in 2012, feels like the opening lines of Irving's story. In my head, walking the streets, I heard the words "Not far from this village, perhaps about two miles, there is a little valley, or rather lap of land, among high hills, which is one of the quietest places in the whole world. A small brook glides through it, with just murmur enough to lull one to repose; and the occasional whistle of a quail, or tapping of a woodpecker, is almost the only sound that ever breaks in upon the uniform tranquillity." The weather was calm. Even the wind was quiet-- and the dropping rain, sparing but ever present. The leaves continued to drift down from the trees, falling to pave the streets. There are several streets intersecting with the main road in the village, and the shops, stores, homes, restaurants and the like did not seem big, did not seem small-- just quiet. Very sleepy. "A drowsy, dreamy influence seems to hang over the land, and to pervade the very atmosphere." I could hear Irving's words very clearly. As I headed closer to the bridge, the church and the churchyard, I began to completely understand the influence a place like this can have, the spirit which makes tales such as the Horseman possible. "A drowsy, dreamy influence seems to hang over the land, and to pervade the very atmosphere. Some say that the place was bewitched by a high German doctor, during the early days of the settlement; others, that an old Indian chief, the prophet or wizard of his tribe, held his pow-wows there before the country was discovered by Master Hendrick Hudson." In the daylight, it struck me how clear you can see Ichabod's path. Walking up the street, you see the bridge, the church and churchyard all in succession-- and, now, you even see a statue of the Horseman's chase, as if Ichabod will eternally be riding that way, for the bridge he will never reach. 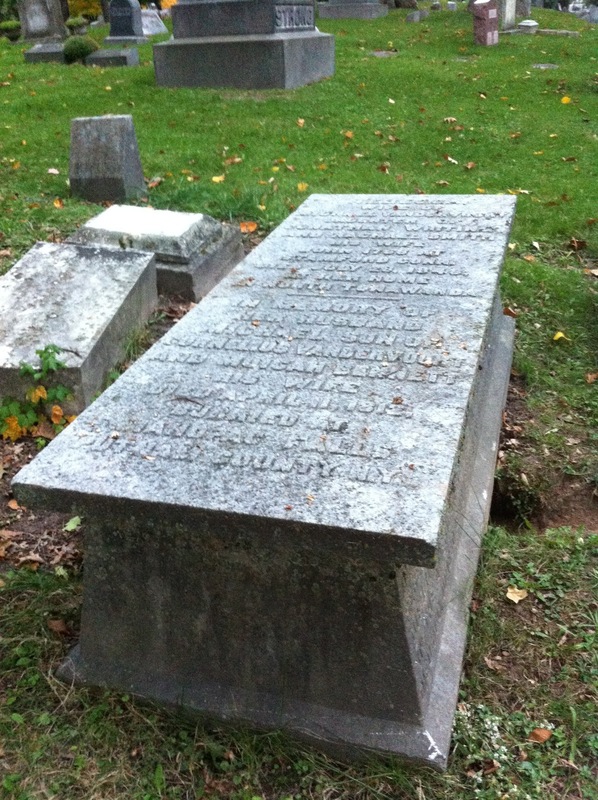 I imagine Washington Irving wouldn't be able to help being proud, if he were able to come back (from the churchyard) to the Hollow today-- and see that the legend he penned to paper has taken on such an immortal life, it nows stands literally in the spot which the fiction took place. It is an awesome thing, an aweseome feeling. Finally, I came to the church again. The plan was to explore the cemetery on my own, in the daylight, in preparation for the tour. Before passing through the gates, I met the tent sent up by the Old Dutch Church to sell souveniors and the like. Incredibly charming people, with wares that many of which were nicer and more interesting the the gift shop by the Horseman's Hollow I'd been to the night before. I bought their book on the cemetery, among other things-- and headed off to walk among Sleepy Hollow's graves. The street, the bridge, the church and churchyard- with the statue far right. While I prepare for Halloween, and get the rest of my Sleepy Hollow posts writtten, tonight I give you a commercial that struck my funny bone. Well done, Snickers. Well done. After the drive full of the changing and falling leaves, I finally got to Sleepy Hollow. I came into the village for the first time at night, well after dark. Crossing the Hudson from Nyack, I can't say for sure what I thought Sleepy Hollow might look, feel like. You come into Sleepy Hollow crossing the Tappan Zee Bridge. The long, wide, winding bridge spans the Hudson River and, at night-- at least on the first night I crossed the bridge-- you can look over your shoulder to the south, and see the lights and skyline of New York City. You finish the bridge, pass the tolls, and take a turn-- and you are in Tarrytown and, suddenly, the Village of Sleepy Hollow. In the opening of Washington Irving's "The Legend of Sleepy Hollow," Irving describes the area known as Sleepy Hollow, and admits that the area is "properly known by the name of Tarry Town." The actual Village of Sleepy Hollow as it stands now is officially known as such, having changed the name to "Sleepy Hollow" in 1997 (which, my cemetery tour guide would later say, did wonders for their tourism industry.) The Village of Terrytown still exists, home to Washington Irving's home and the delicious Tarrytown Tavern-- but more on those places, later. Driving into the villages of Tarrytown and Sleepy Hollow feels small. You are suddenly driving along a winding, hilly, tight street lined with a small and-- absolutely-- sleepy village. In Tarrytown, you begin to see the images of the Horseman. On flags adorning people's homes, on shops and in restaurant windows. And then the sign for the Village of Sleepy Hollow appears, and the Horseman is everywhere. 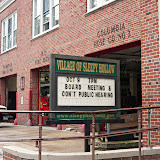 On the town hall, on police and fire vehicles-- and then you are at the center of Sleepy Hollow. All the while you have been driving along the hilly terrain you have been driving down-- and just as you hit the bridge by the church the road begins to climb up. The altar, with Ichabod jack o'lantern atop. The bridge by the church is the bridge by the church. The Horseman's. Washington Irving settled in the area he loved after being sent there during his youth from New York City to avoid the yellow fever outbreak in the late 1700's. There is something so uniquely special, moving, about seeing the inspiration of a story you have loved all your life, and held so dear. Seeing that, yes, the story is real. "The Legend of Sleepy Hollow" has long dominated my literary understanding, and my love for the Halloween season. 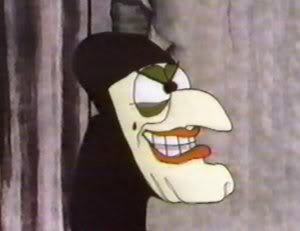 Since childhood, the animated Disney version of the tale has been the standard all other ghost stories are held to. There is so much in the story, about the telling of tales, of ghost stories, about what is and can be truth with the supernatural-- that is so classic, so autumn, so ripe of the harvest, so Halloween. Walking up to the bridge, and seeing what brought Irving to write the story-- still there-- was amazing. No, the bridge is not wooden and covered and in the woods, but the bridge is there. Paved over and modern, there is still a river it stands over-- and you cross the bridge, look up and see the Old Dutch Church; which, too, remains. I had tickets to the last performance of "Irving's Legend" for the evening, which takes place in the Old Dutch Church. "Irving's Legend" is a performance piece by professional storyteller Jonathan Kruk, who offers a one man (and an organ player) performance of "The Legend of Sleepy Hollow." I tell you, the grinning smile spanning from my one ear to the other did not leave my face the whole night. I was in Sleepy Hollow. Having crossed the horseman's bridge. In the Old Dutch Church. Outside each window, you can see the cemetery which surrounds the church. And you are surrounded by candle lit jack o'lanterns. With the organ blaring. And then the tale of the horseman begins to be told from the altar. Jonathan Kruk gives a great performance of the tale-- and it's certainly worth noting he gives these performances multiple times a night, most nights. Being told live, as he does, you truly get to experience such an essential part of Irving's tale-- how the Horseman is all about the legend, the telling of ghost stories together, and sending you out home, alone. Into the darkness. After Kruk's performance, I walked around the church taking photos, still on a cloud of Halloween. Later, taking some outside of the church, I quickly realized my limitations with my camera at night-- taking photos in the dark is something I don't have much experience in, and playing with the flash and seeing what it can and cannot do made me wish I had practiced some more before the trip. But I don't think all of these photos are bad, and I loved taking them. It was so hard to be torn away from the old church, the cemetery, the bridge and the rest of the hollow, in the dark. Across the street, and down a riverbank, is the Horseman's Hollow haunted house attraction, but even that was dark, quiet and sleepy. Occasionally, on a light wind, the screams of those going through would drift over. And there was nowhere else I would rather have been. In vain, I tried taking some pictures of one of the Horseman and Ichabod statues in the dark, before acquiescing to go back to the hotel-- and return with the daylight on Sunday to spend the day exploring the village and, at long last, the cemetery. This evening, I finally took the majority of the Forest Lawn monthly twilight tour, which I had been waiting to do all year. And I saved for the last one of their season. The sky was grey, all day. As I got out of the car at the cemetery, the air had a small, setting chill and began to rain. Lightly, a mist. There was truly no other place I would have rather been. We had a small group, and a wonderful guide, who was so knowledgeable about the lawn. I did learn several things I had known nothing of before. A corner patch of the cemetery, seemingly blank and by a tree, which I run by almost every other day, contains a large number of remains from unidentified people who perished in a horrific train accident in the 1800s. A large mausoleum I have noticed before is the resting place of a state representative who sat by President William McKinley's bedside as he died, after being shot here in Buffalo, in 1901. So many stories. So many stories. So much time. I wish I could go into more detail on the tour, and how wonderful it was to be in Forest Lawn after the gates had closed and the sun was set. But tomorrow I am off on a road trip-- to Sleepy Hollow, NY-- and at least one other cemetery tour, there. Which I will blog about as soon as I am able. 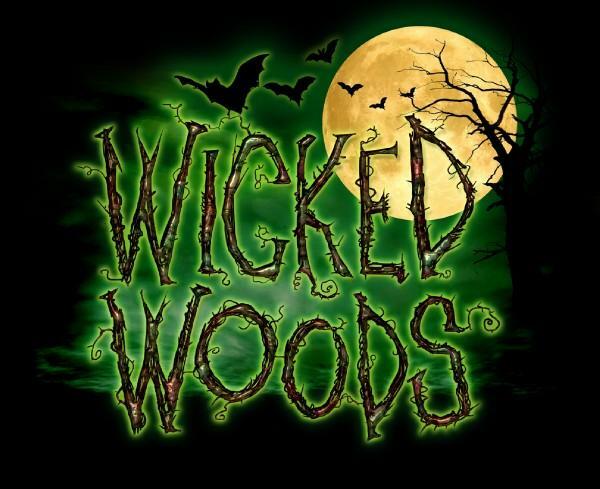 No, it doesn't feel like it is Halloween until I've stepped foot into one of our local haunted house attractions, of which I am fortunate enough to have a few in my area (as I have written about in the past.) This year, I was able to go to Frightworld on opening night. My friend and I wondered, before going, if opening night just before the start of October would mean wall to wall people, or if the place would be completely dead in every sense of the word. In the end, we concluded it would likely be dead. Were we ever wrong. Frightworld on opening night was mobbed with people-- mostly young kids in their early teens. I do prefer not having to wait in line for twenty minutes before going into each house; but, there was just something exciting about being there with so many people excited for Halloween, looking forward to being scared. As a review of a house, Frightworld was again in the same location this year, and was mostly the same. There were some minor tweaks, such as the elimination of the Headless Horseman (who I was always partial to) in "Wicked Woods" and the introduction of quite a few feet of fencing in that house (which clearly felt like filler, and truly served no point.) In the haunt, you are walking through an outdoor woods/cemetery setting, and walking through cabins, and you walk out of one of the cabins into this stretch of yard fencing. One or two of the actors from last year were back, and they were among the better ones- which I appreciated. There is a woman playing a character dressed as a young girl, sitting on a bed and playing with dolls, who has mastered a voice and air so creepy- I cannot do justice to it with words. "Do you want to play with me?" And, yes, the balloon rooms, which I have blogged about in the past, remain the single thing about the attractions that get my heart beating the fastest. Stepping into the dark, feeling the walls, floor and ceiling close around you, until you are encased on all sides and your personal space taken over by the balloon-like walls and ceilings you have to make it through. That is fear. I believe that this is year three of my experiencing them, and every time I do, the long stretch at the end makes me question whether or not I'll make it through, that the fear will never end. And a haunted house could not ask for a better result. One minor qualm about Frightworld this year. 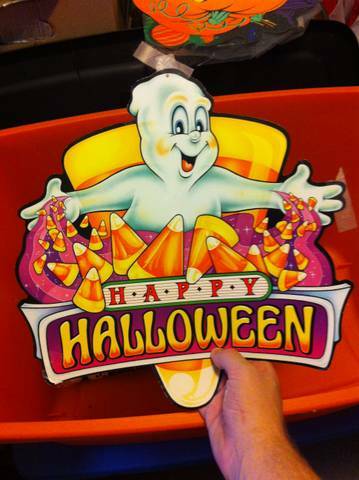 Even though your ticket is hole punched over each house as you go into them, and cut in half at the end, you are not allowed to even keep the mutilated ticket to take a picture of, to post on your write up of the night on your Halloween-themed blog. And that is why I don't have any pictures but their logos. 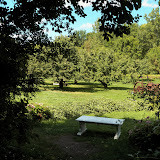 This weekend, I made my yearly pilgrimage to Mayer Bros-- our local and revered cider mill and bakery. The setting is ideal- a small, barn-like red building with a bakery smelling of apple, maple and any fall spice you can think of. To the left of the cider mill is St. Paul's Lutheran Cemetery, which I have blogged about before here. While my visit did include the purchasing of many apple spice and maple walnut doughnuts, apple cider and even an apple cider slushie-- it did contain some maple candy. 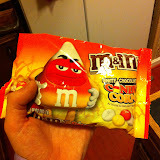 And that made me think of last year's Halloween Candy Project- my documenting, collecting and posting photos of all the Halloween candy I came in contact with last year in a photo album here on the blog. I like to think the effort wasn't completely a waste of time. And it is, shall we say, interesting to look back and see all the sweet strange sugary calories I consumed last year during the fall season. So I've decided to do it again. This year, I've started off small: a pumpkin Peep; a new, yet to be tried, bag of Candy Corn M&M's; and, even, some sweeter things of note which are not real candy (such as an apple pie or the above mentioned cider slushie). 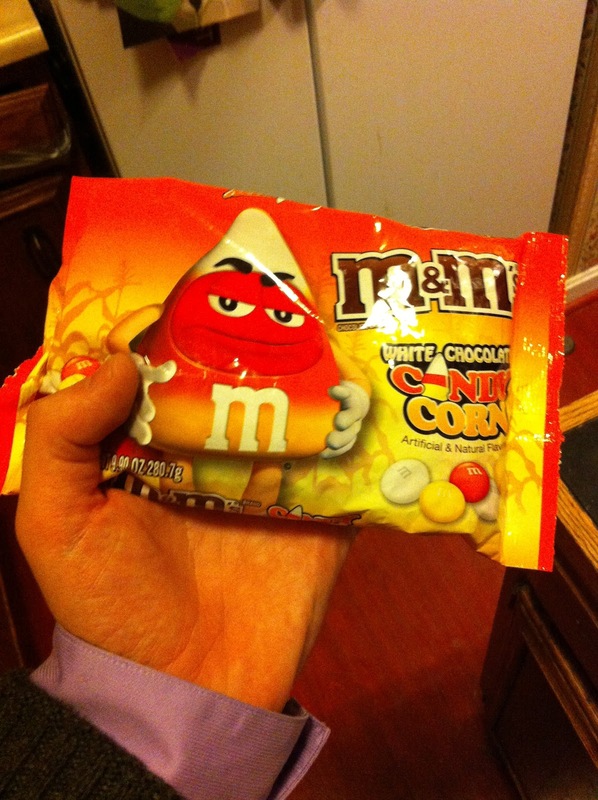 I'm not sure if this year's candy project will be interesting, boring or somewhere- anywhere- in between. We shall see. I will be uploading new photos to the album as I take them, and will be trying to include comments on the photos if I end up not being able to post many updates about the project here on the blog itself. I've always been fascinated by the history of urban legends. 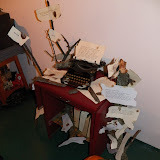 Trying to trace the trail back to when the first time the story was told about the ghostly hitchhiker, or the man with the hook at a lover's lane. And this is why I became rather enthralled when I quite accidentally stumbled upon the- for lack of a more accurate term- legend of the Slender Man. 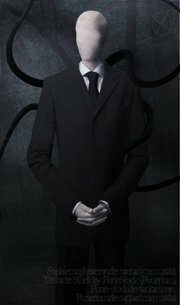 After coming upon what appeared to be an urban legend I had never heard before, a quick Google search of the "Slender Man" gives you what appears to be a complete, detailed and time-tested history of a mythical supernatural creature; tall and slender, often dressed like a man, but with no discernible, or blankly white, face. Think of a darker Jack Skellington. 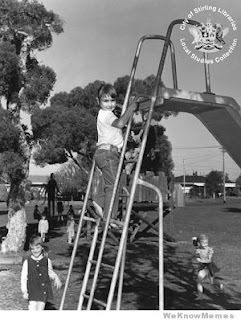 The Slenderman has been reportedly sighted near children who have subsequently disappeared-- captured in black and white photos, and, even audio footage. For all the Slenderman's purposes, he seems nothing but the Bogeyman's latest incarnation-- even if he has something of a patchwork of sightings throughout history, in everything from old German woodcuts to accounts of Allied soldiers in World War I encountering Slendermen as German soldiers on the battlefield. The story which has sprung up on the Slenderman is detailed on a "Creepypasta Wiki" entry, a website I previously knew nothing about, but is apparently a forum where people submit brief, horror themed short stories which are called creepy pasta, rather than a short story. This mythos, while not entirely convincing, seems, at least for yours truly, as if it could have benefited from the less is more approach of more modern urban legends (like the Blair Witch), rather than trying to create a new character who has literally been present from the beginning of time. However, I do find the speed and popularity with which the legend of the Slender Man has taken off to be impressive-- making use of all the Internet age's tools to spread stories. 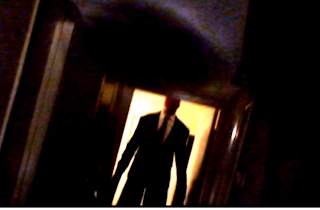 In fact, the whole legend of the Slender Man originated entirely from a contest on an Internet forum to create creepy supernatural characters and images. Given how easily online forums and other social media has birthed this first urban legend created entirely from the Internet, I would imagine the Slender Man is the first of many to be created online in years to come.